Over Built Mountain top luxury mansion on 3.5 acres offered at a quick sale price! Enjoy the cool climate and astounding expansive ocean and valley views from this 4 bedroom 4.5 bath home on manicured grounds with big pool and jaccuzi, and a large covered dining entertainment area next to pool deck. Walk out of each bedroom onto private balcony offering comfortable breezes as well as the expansive views out the valley and to the pacific. Some of the finest tropical hardwoods used throughout the home with very elegant furnishings and the finest imported fixtures, all included with the sale. 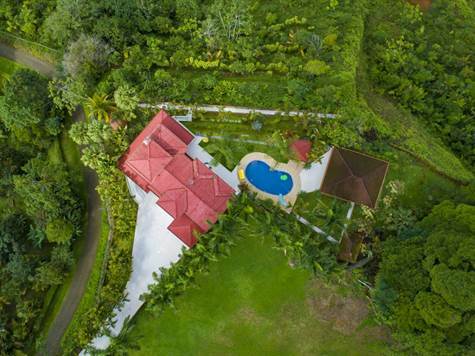 Conveniently located within 20 minutes of the pristine beaches from Dominical south and north. Motivated Seller, and priced for "Quick Sale" Take advantage of the opportunity!